Nobody disputes the fact that broccoli is a great vegetable to have on your dinner plate - in fact, this plant is considered one of the best superfoods. Rich in vitamins A, C and E, broccoli is renowned for its cancer-fighting capabilities and it’s also one of the top cruciferous vegetables. Most people, however, consume only the florets, and they bin the stem and leaves without realizing that they are throwing away an abundance of health-promoting nutrients. Find out how to prepare and eat broccoli the right way and get the most out of your super vegetable. The stem is a much better source of fiber than the florets and has a delicious sweet flavor. To include it in your meal, peel off the outer layer and slice it into small cubes. It’ll need to be cooked a bit longer than the florets, so add it to the pot a few minutes earlier. Broccoli leaves are the plants overlooked gem. They contain the most beta-carotene of all parts of the plant. This natural bright pigment has been recognized as a substance that can reduce the risk of breast cancer in pre-menopausal women. Leaves also abound in vitamin A, a fat-soluble vitamin, which plays an important role in the immune system function and protects your vision. Furthermore, they contain lots of vitamin C – another cancer fighter. 30 grams of leaves provides you with 43% of your recommended daily intake of vitamin C. Leaves can be used in a similar way to florets. Consider them just another leafy green vegetable to choose from. You can boil, sauté or grill them and enjoy their mild taste – but for the best cooking method, see below. It’s not just about what you eat. It’s also about how you prepare it. This is especially true for broccoli. By using the right method of preparation, you can make a big difference to your health. And we have already mentioned it in my post about the best cooking methods to keep the vitamins in the food. If you want to enjoy the full spectrum of this veggie’s benefits, you should steam it. A 2008 study published in the Journal of Agriculture and Chemistry showed that steaming broccoli is by far the best method of preparing it. It’s the only method that preserves, as well as increases its cancer-fighting potential. Boiling and frying, on the other hand, have been found the most damaging to the broccoli’s health effects. If you do like your greens prepared in other ways and would like a break from steaming, not all is lost. A study from 2010 revealed that adding some spice to your broccoli enhances the anti-cancer properties. To get this effect, spice up your broccoli with mustard, horseradish, wasabi or chillies. So don’t shy away from all those green and red chilies, and enjoy a hot meal that will preserve broccoli’s goodness. 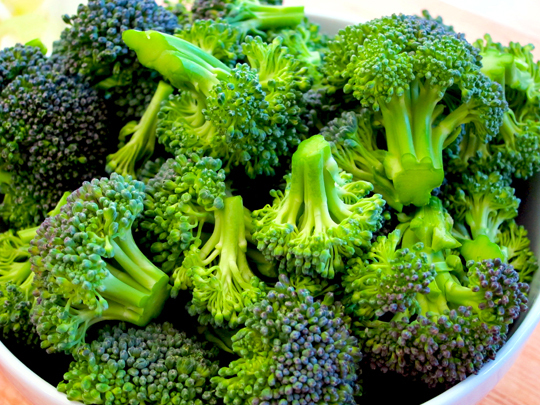 When selecting your broccoli, go for the plant with dark green, purplish-green or bluish-green florets. They contain more beta-carotene compared to their pale green or yellowish-green counterparts.